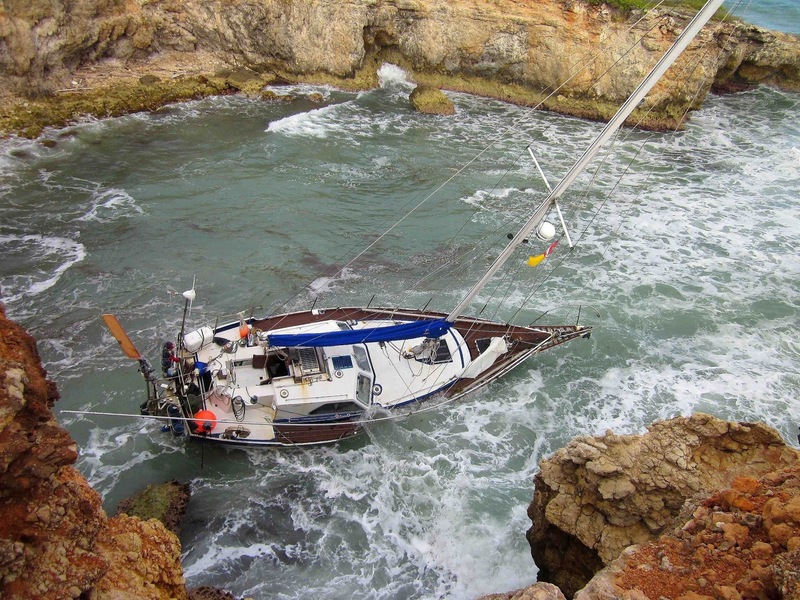 First, adventure seekers, I would ask you all to pause in your busy daily tasks to send positive vibrations to our good friend Alan to lift his boat Snow White off the rocks at the entrance to Ponce, Puerto Rico. There are limits to human endurance and I’m afraid when the body has had enough it does what it wants. Good luck, Alan. 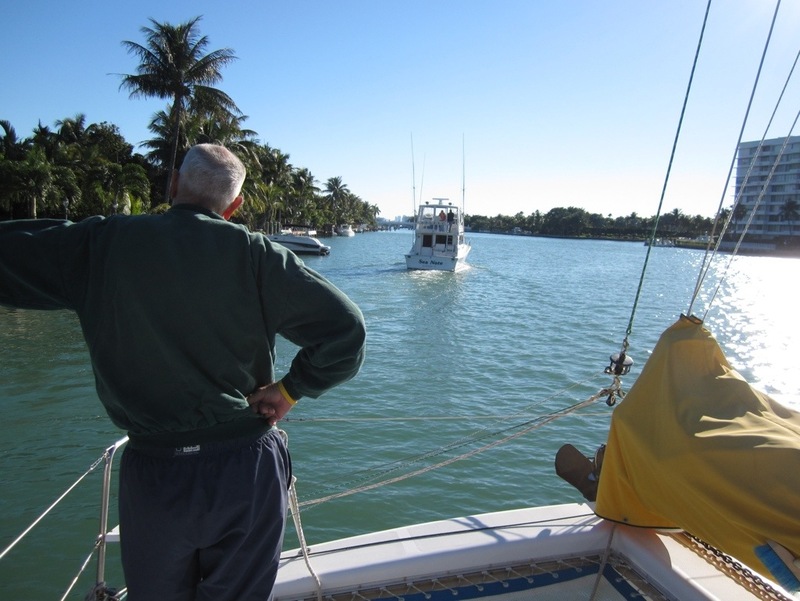 Here in Miami much work has been done on Escape Velocity while tied to the outer pilings of our good friends’ dock. The long anticipated arrival of Capt. 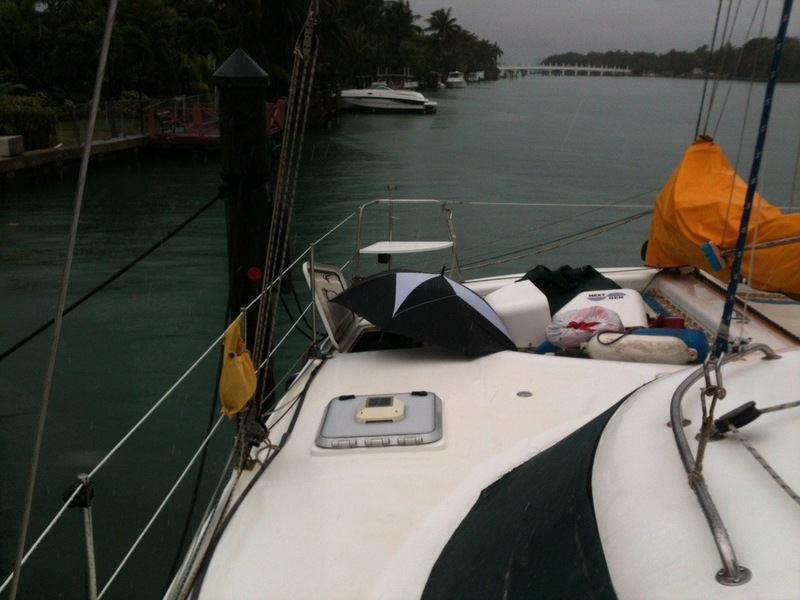 Joe Hanko on EV saw the day dawn cold and rainy and he had boat show traffic to fight through. With the late start I wondered how much we could accomplish but we just put our heads down and pressed on. 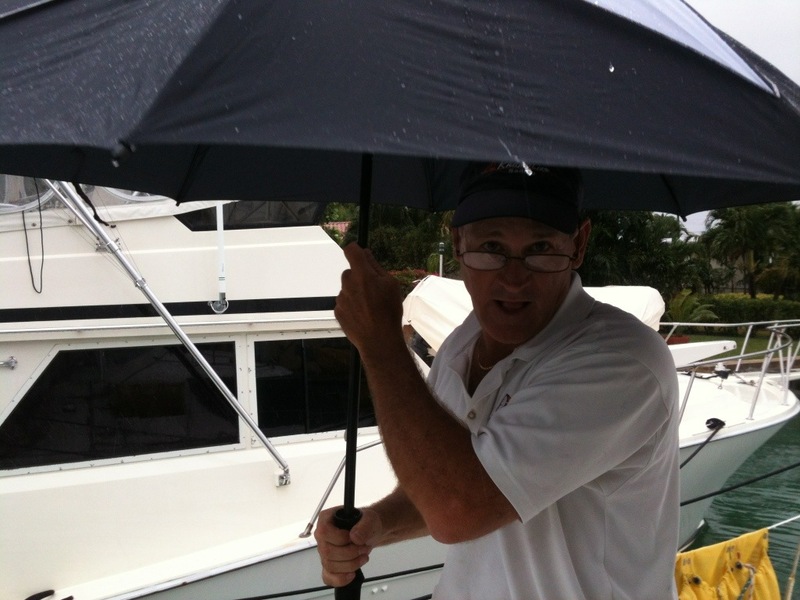 A sailor on our boat with an umbrella; you saw it here first. We started with the generator which was rewired with waterproof circuit breakers and scary household wire thrown away. That’s Joe down in the port hull. I’ve spent some serious time down there and I can unequivocally say it’s not fun. 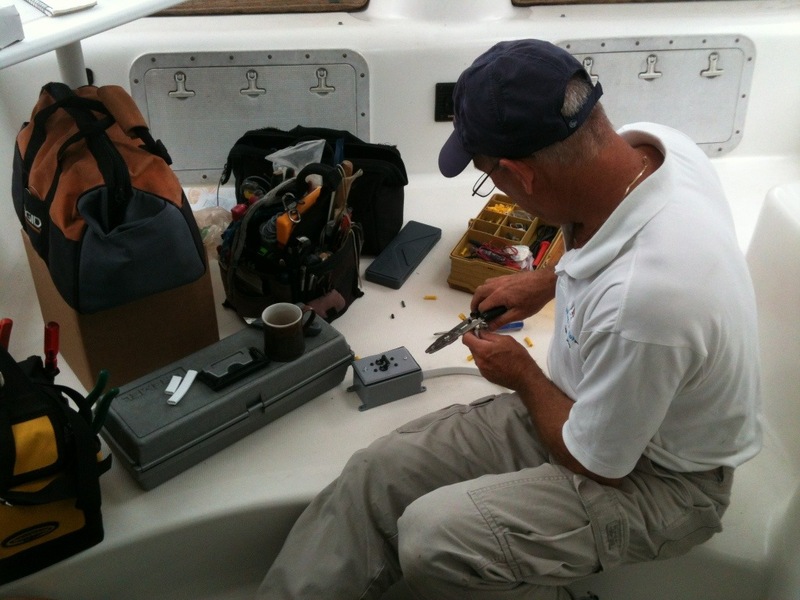 Every time we opened up a compartment we heard, “What in the world were they thinking?” He straightened out a lot of problems, mostly electrical, which I feel good about because I couldn’t make heads or tails out of the wiring the way it was. By the time we finished the electrical system it was dark and very late so Marce made dinner for us. 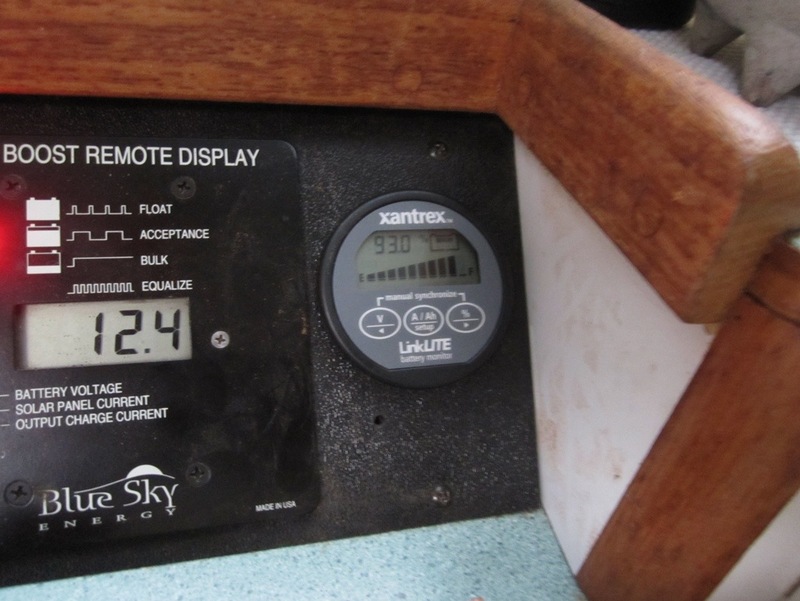 With our new battery monitor we can now run the LED TV on the inverter and know exactly how the batteries are doing. 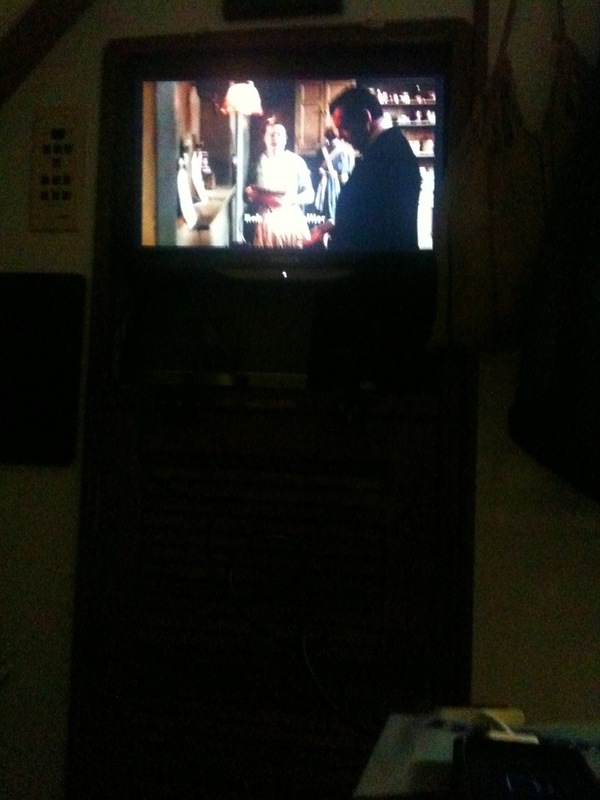 We caught up with Downton Abbey by watching the PBS app on an iphone on 3G, fed into the TV with an HDMI cable! Amazing. I’m sure AT&T never envisioned this when they offered an unlimited data plan. At the Miami boat show we found an AIS unit that has WIFI and got a “boat show price.” More on that project later. So it’s back up to Fort Lauderdale because the Julia Tuttle Bridge in Miami has only 56 feet of clearance and we need at least 62. We’ve really enjoyed hanging with our friends Jeff & Nancy and the tranquil Indian Creek Canal.